“A friend recently told me about a company called Thred-Up. It was actually started in 2009 and is basically an online consignment shop where they handle everything for you. 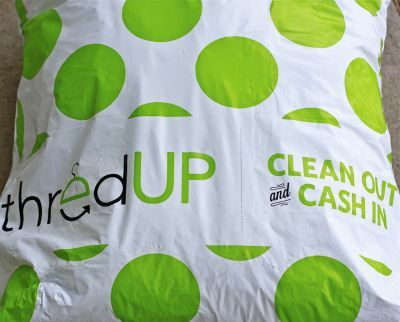 You go to their website, http://www.thredup.com, and request a bag. (I was sent the bag for free during a promotion. Sometimes they request a $4.95 deposit for the bag. It is fully refunded when you send the bag back.) They send it to you along with a prepaid label, so you pay nothing to ship the bag full of clothes to them. You stuff it full of your nicest children’s clothes, then either drop it at a local UPS store (we have one in the Hastings shopping center) or you can leave it by the mailbox for the mail carrier to take it. Thred-up will then sell your clothes on their site. You can see what certain clothes usually sell for so you’ll have an idea of how much money your items will go for. Once your clothes sell the money can be directly deposited into your PayPal account or you can use it as credit at Thred-up to order new clothes. Previous thredUP review: Thank you thredUP!